Whether you are a small business or an individual getting a paycheck, taxes are an everyday reality. If you are working for an employer, you need to consider how much money you will make per hour after taxes. Your per hour rate is higher than your take-home pay. There can be a significant difference between Gross Wages, or the amount you before tax withholdings, and Net Pay, the amount you actually receive after your tax deductions. Being able to answer “How much will I make after taxes, hourly?” is important whether you are considering a new job or are accepting a job offer. Understanding how much your check will be after taxes can help you compare job offers, decide to switch jobs and can help you budget per month. You don’t want a surprise when payday comes. If you are an employer, you need to determine tax withholdings for employees. Even if you’re a small business with just one employee, you may need to deduct and withhold taxes. You also need to answer employee questions about taxes. A common question you may be asked is “What will my paycheck be after taxes?” and you need to be able to answer that accurately. If you’re an employer, you also need to address the difference between gross wages and net pay. If employees are disappointed by how much their pay is after tax or don’t understand how much taxes are deducted from a paycheck, they may be unhappy in their positions and may even look for a new job. You don’t want to lose good talent because of taxes you need to pay by law. Helping your employees understand how much their paycheck will be after taxes and have a system for answering questions about how much federal taxes are withheld from a paycheck can help you keep communication open. Money Help Center provides calculators to help you determine what percent of your employee’s income should go to taxes and you can give links to these calculators to your employees so they can understand how much their paycheck will be after taxes. How Much Money to Save for Taxes If I’m Not a W2 Employee? More and more Americans are taking nontraditional jobs. If you’re one of them, knowing how to figure out take home pay after taxes is a key concern. You need to set aside enough to pay for estimated tax installments and your tax bill in April. If you’re wondering “How much taxes do I pay from my paycheck?” so you can start saving for your tax bill, our calculators can help you determine how much should be to setting aside. This can help you start a tax fund so there are no surprises, and you can pay your bill in full. Capital gains taxes are paid on sales of assets that aren’t inventory. They are typically paid on stocks and other investments. Understanding how much capital gains taxes you pay on stocks is important if you are investing. If you expect an inheritance, understanding how much tax you pay on the lump sum can also help you with long-term financial planning. If you are in real estate, using a long-term capital gain tax on property calculator can help you evaluate the possible return on your investment. We all pay taxes, and we are obligated to do so. 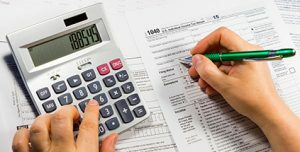 Trying to determine how much your paychecks are after taxes, how much money you need to set aside for taxes and how much you can expect to pay to the government on assets sold can be difficult. Tax rules change all the time and trying to understand complex state and federal regulations is difficult. Money Help Center makes it a little easier by providing you with a range of calculators to help you get estimates for your tax needs. Whether it’s April and you are attempting to determine your taxes or you are taking the initiative and figuring out long-term tax planning, we have calculators to help. Our calculators are easy to use and allow you to punch in numbers and get real results. We make taxes just a little easier. Since our free online calculators aren’t associated with any vendors or financial services, you get unbiased information you can use. As a third-party vendor, we just give you the numbers and the raw data so you can make the choices that are right for you. Try our calculators today. What percentage of your paycheck are you keeping versus what’s going to taxes?